action Figures, games, cups, clothes, beer and even... Easter eggs in reference to those of the dragons of the Khaleesi... The diversity of products derived from the mythology Game of Thrones (GOT) is simply outstanding for a series. About sixty categories of products, the brand GOT are listed, among which one may mention products that are as unusual as cutting boards, methods to learn the language of the series Dothraki, or even a dock-door in the likeness of the character Hodor. If income-specific derivatives are difficult to calculate, the New York Times was estimated in 2017 to $ 1 billion of total annual turnover of the series for HBO. And while the eighth and final season of the series of all the records has been started in the night of Sunday to Monday, which is broadcast on OCS City, the goose that lays the golden eggs is not ready to stop, far from it. As every year, the site price comparison Idealo has prepared a study on the popularity of the derivatives of the series, from its own database. To treat of the evolution of the phenomenon, Idealo compared the data for the period June 2016 - June 2017 and those from June 2017.
the First observation is that the classification of derivatives the most popular remains the same: no one's surprise, the DVD sets and Blu-Ray remain at the top of the podium, with 39% of related searches. The DVD set offering the complete seasons 1 to 6 is the most requested. However, the DVD has significantly decreased: it was of 55% by June 2017. Come in second place in the games, that gathered 3% between the two periods: their share has risen from 31.5% to 34.5%. The unbeatable of the games remains the Risk Game of Thrones , followed by the Monopoly and Cluedo. In the third position, but with a share of more important, come the figures derived from the characters of Game of Thrones , whose research increased from 8% to 25%. The success of the figurines, in particular, just the brand Funko Pop! : the three figurines are popular from this brand, the main feature of which is their head disproportionate to the body. In the order, the figurines of the characters favorites are the ones of Daenerys riding are dragon Drogon, Robb Stark, and finally the king of the night accompanied by the dragon Viserion. to a lesser extent, video games and collectible cards, complete the ranking, even if their share tends to decrease: it fell from 4.7% to 1.4%. Between June 2016 and June 2017, the main video game derivative was Game of Thrones : A Telltate Games Series. 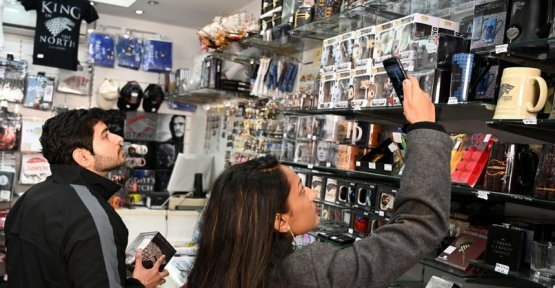 If the DVD, board games and figurines are derivatives the most popular, other ideas of shops unusual have emerged over time to exploit the fad Game of Thrones . - the best-known example is that of the bakery in london named "You know nothing John Dough" in reference to one of the citations, the most famous of the series. This bakery is unique in that it was opened by an actor of the series, Ben Hawkey, who plays the role of a Hot Walk, a young orphan whose dream is to become an apprentice chef. His dream in the series has become very real in July 2017. The bakery sells items such as bread in the shape of a wolf Game of Thrones , at $ 1 a piece. At the opening of the bakery, the orders have so exploded that the chain of home delivery Deliveroo had to stop temporarily the traffic. - After the bakery, or hotel. This time, it is in Finland that he must go, to Kittilä in Lapland, more precisely. It is a hotel made of ice ephemeral, designed by the group Lapland Hotels and inspired by the coldest region of the series. To spend a night there, you would have to pay 167 euros and sleep under a temperature of -5°C. visitors can also enjoy a bar or even get married in a chapel designed for the occasion! The project was in need of the best ice sculptors to make the best effect. Open during the winter of 2018, the project has been renewed this year, strong of its success. - The bars ephemeral Game of Thrones also tend to multiply around the world. In July 2017, the first experiment of this type was opened in Washington: a fully licensed bar decorated according to the codes of the series. Consumers could, for instance, a drink of the mead in the iconic tree, sacred of Winterfell, almost a false dragon spitting fire. Customers could also take a picture of themselves on a throne of iron. Result: about two hours in line to enter the bar, between 900 and 1500 people each day, according to the owner of the bar. - The tourist sites where the scenes from the series were filmed have also seen their profits leap, particularly in Northern Ireland, where there are the main sets of Game of Thrones . Since the beginning of the series, the region has experienced a 300% increase in the number of tourists, and 30 million pounds per year. In Dubrovnik, for example, where the façades and the walls were inspired by the capital of the kingdom of the seven crowns, the influx of fans is so important that the inhabitants have manifested their discontent, and introduced quota of visitors. - It is in Northern Ireland and in Ireland that the project " Game of Thrones Legacy Experiences " is expected to be launched this year. In the program, the decorations of the castle of Winterfell, the city of Port-Réal or even the fort of Châteaunoir where the Night Guard can be visited on the way to amusement parks. At each visit, costumes, accessories, weapons, will be presented to plunge into the atmosphere of the series. - in the face of such enthusiasm, HBO has decided to re-launch new projects derived from the series. The filming of a prequel (a antépisode) is scheduled for the summer with Naomi Watts, and is expected to be released in 2020 or 2021, and is expected to be thousands of years before the events of Game of Thrones . The four scripts would be in the drawers with new characters and new storylines. The myth Game of Thrones has not finished creating profits.